1. Configure the routers R1, R2 and workstation WS1 as per the table given above. 1. Select device R1 from Select device drop down box. 2. Click Configure button, this enables left navigation pane. 3. In left navigation pane click Interface Management > Interface and Connection. 4. In Interface and Connection screen click Edit Interface Connection tab. 5. From the interface list select S0/0 interface and click Edit button. 6. In Edit interface feature dialog screen enter the IP Address as 192.168.100.1 and mask address 255.255.255.0 ,Select Enable from Interface Status drop down box and click OK button. 7. Click Router > Dynamic Routing from left navigation pane. This opens up Routing screen. Select RIP from Dynamic Routing list and click Edit button. 8. In Edit IP Dynamic Routing screen select RIP version 2 and click ADD button. 9. Enter the network address as 192.168.100.0 in Add a Network window and click OK button. 10. Select Device R2 from Select Device drop down box. 12. Select WS1 from Select Device drop down box. 13. 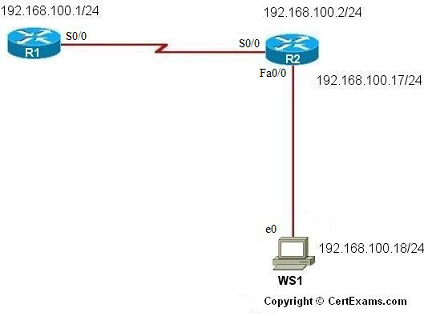 Repeat the steps 3 -6 for configuring WS1 with IP address as 192.168.100.18 255.255.255.0 and default-gateway ip address as 192.168.100.17. 14. Select R1 from Select Device drop down box. 15. Click Router > ACL > ACL Editor from left navigation pane. 17. In Add a Rule screen enter “denyping” in Name/Number field. 18. Select “Named ACL rule” from Type drop down box and click Add button. 19. In Add Named Access-List entry screen select “deny” from Select an action drop down box. 20. In Source Host/Network select “host” from type drop down box and enter 192.168.100.18 in IP Address field. 21. In Destination Host/Network select “A Network” from type drop down box. 23. Select option button “icmp” from protocol and service options and click OK button. 24. In Add a Rule screen click Add button again. This opens Add Named Access-List entry screen. 25. Select “permit” from Select an action drop down box. 28. Select option button “ip” from protocol and service options and click OK button. 29. In add a rule window click associate and select interface as s0/0 and direction as “inbound” from Associate with an interface screen and click OK button.